Hazare was born on 15th January 1940 in Bhingar. Bhingar is a village near the town of Ahmednagar, Maharashtra. Baburao Hazare, Hazare's father worked as an labourer in Ayurveda Pharmacy. Anna Hazare’s grandfather was in the Indian army, posted at Bhingar, when Anna Hazare was born. He died in 1945, but Anna Hazare's father continued to stay at Bhingar (Maharashtra). In 1952, Anna Hazare's father resigned from his job. And he returned to the village, Ralegan Siddhi. Anna Hazare had 6 younger siblings and the family of Anna Hazare faced significant hardships. Anna Hazare's childless aunt was offered to look after him. Anna Hazare studied in Mumbai. 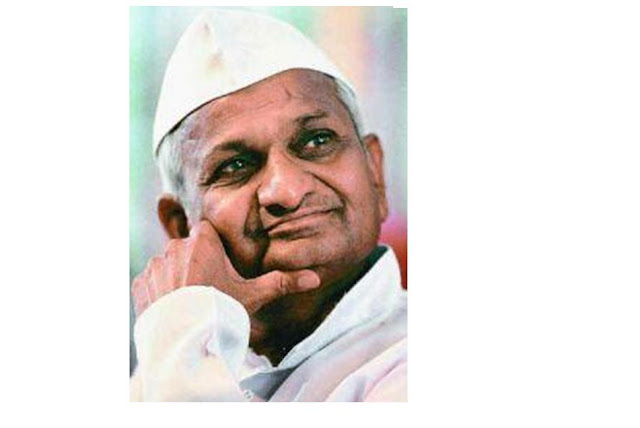 He studied up to the seventh standard in Mumbai and then sought employment (in Mumbai Anna Hazare started selling flowers and other items at Dadar city (Mumbai) to support his family. Hazare soon started his own flower shop and brought 2 of his brothers to Mumbai. Gradually Anna Hazare's income increased to around Rs. 850 per month, a good income in those times. Later he started his career in the Army as a driver post in 1963. Hazare spent his spare time reading the works of Gandhi, Vinoba Bhave and Vivekananda, they inspired Hazare to become a social activist. During the Indo-Pakistan War (1965), Hazare was the only survivor in a exchange of Indian border fire while driving a Truck in Khem-Karan Sector. During the 1970s Hazare survived a road accident while motor driving. On 5th April 2011 Anna Hazare started a 'fast unto death' to exert pressure on the Indian government to enact a strong Anti-Corruption Act as the envisaged in the Jan Lokpal Bill, a law to establish a Lokpal with the power to deal with the corruption in government offices and public offices. The fast led to the nationwide protests in support of Anna Hazare. The fast was ended on 9th April 2011, the day after all of his demands were agreed by the Indian government. The government of India issued a notification (Gazette) on the formation of the Joint committee (Both Civil and goverment society representatives.) to draft an effective Jan Lokpal Bill.